The 2016 Nautique U.S. Open of Water Skiing presented by Roger Dean Chevrolet, saw Team Nautique athletes take home four titles among nine podium finishes. Beautiful Okeeheelee Park in conjunction with the Ski Club of the Palm Beaches, set the stage for the action as the record-breaking Ski Nautique 200 performed flawlessly in all three events giving the athletes the ability to put it all on the line in the final major event of the season. In the Men’s Trick event, Nautique athlete Aliaksei Zharnasek is in a league of his own. Recently setting a new pending world record behind the Ski Nautique 200, Ace is flawless in execution, winning the Nautique U.S. Open with an incredibly technical run that earned him 11,620 points. Nautique’s Josh Briant has been consistently finishing near the top progressing by leaps and bounds each time we see him on the water. The young Australian had an amazing run with 11,140 points to take the podium in third. Team Nautique skier Natallia Berdnikava showcased versatility and consistency that earned her two podium finishes placing third in women’s tricks with 9,520 points and third in jump with a distance of 171 ft. (52.8m). Nautique athlete and jump phenom Jacinta Carroll logged her 30th professional victory and put a cap on her world-record breaking week in Women’s Jump finals. At an event earlier in the week, Carroll set two consecutive world-records behind the Ski Nautique 200 first flying 194 ft. (59.2 meters) before launching to 198 ft. (60.3m) in the next round. “The final event of the year once again proved to be an exciting one. As always the Ski Nautique 200 provided me the best opportunity to jump as far as I can. My 30th win in a row at the Nautique U.S. Open was the best way to finish the year!” – Jacinta Carroll. In an exciting Men’s Jump final, world-champion Nautique athlete Ryan Dodd went one-and-done for the win exploding off the ramp behind the Ski Nautique 200 to soar 227 ft. (69.1m). Team Nautique Jump legend Scot “Rocketman” Ellis took the podium in third place with a jump of 216 ft. (65.9m). “The Nautique U.S. Open win meant a lot to me for a few different reasons. Up until 2 days before the event I wasn’t even sure I was able to compete due to a recent crash. I decided to go for it and push my limits a bit. Taking the win on my opening jump by a margin of 9ft was the perfect way for me to cap off my season and lock in my number 1 world ranking for the winter! I was thankful to just be able compete so this win was a massive bonus for me!” - Ryan Dodd. Slalom World-Record holder and Team Nautique athlete Nate Smith returned to action at the Nautique U.S. Open and remained true to exceptional form heading into the final in top seed. Smith looked as smooth as ever behind the Ski Nautique 200 just missing the top spot by half a buoy to finish second running 2.5@41-off. An emotional Women’s Slalom win for Nautique’s Whitney McClintock showed her grace under fire as the entire field had impressive performances behind the Ski Nautique 200. For the first time ever in a Women’s slalom event, all three podium finishers ran a full 39-off pass putting the pressure on as McClintock took the water. The Nautique U.S. Open Champ could not be shaken and a fist in the air put a seal on the title with a score of 2@41-off. “Matt and I have been working really hard on my slalom all summer to get me back on the top of the podium. 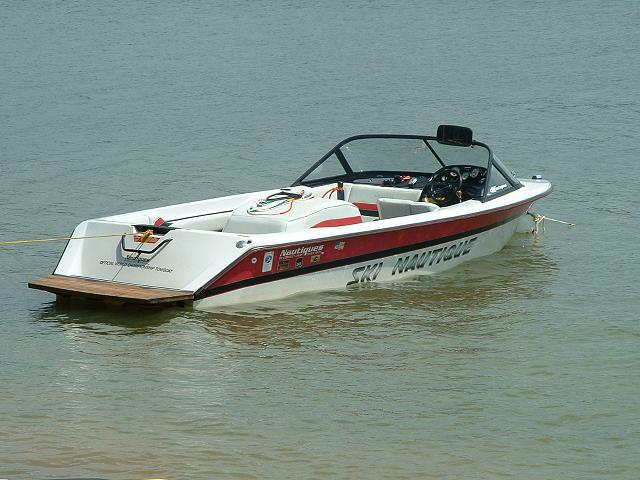 The Nautique U.S. Open was such a great opportunity to ski on a perfect lake behind the Ski Nautique 200. I was confident that I could run 2@41 and was proud of accomplishing my goal in the first round. After Manon & Regina both ran 39 in the finals I knew my goal was still the same, 2@41. I was still confident I could accomplish that & more…Unfortunately, when I got outside 2 ball and started celebrating it made it really hard to get to 3 ball! !” - Whitney McClintock.